GNU/Linux is improving fast and can already replace Windows in almost all cases, but there are still some areas where we really have to catch up with what is currently the most used operating system. I mean, come one, we don’t even have a Blue Screen of Death! Well, now this is no longer true. 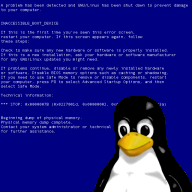 Some months ago I decided to have a go at fixing this sad issue, and here it is: the BSOD for GNU/Linux, freely available on my PPA. This little application comes perfectly documented with a manpage and has features as important as: random selection between a bunch of real error messages, allowing to change the name of the OS to show (bsod –system=ReactOS), a realistic mode where the victim will have to type “FS” or “GNU” to quit (bsod –realistic), and the possibility to have it running in the background and pop up after a random amount of time (bsod –delayed), amongst others!